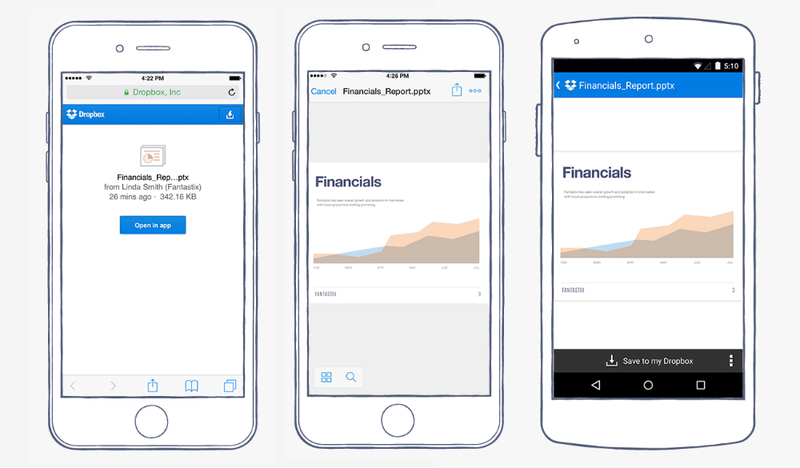 Dropbox is updating its Android and iOS apps, bringing a feature which we might have already assumed existed within the app. Once updated, users can open shared links directly into the Dropbox app, then choose it as the default option for files and documents. “Starting today, when you click on a Dropbox shared link from your mobile device, you can open the file or folder right in the Dropbox app — which means you get rich previews for documents and photos and an easy way to save the file or folder to your Dropbox account,” the company stated in a blog post. To be a tad more specific, the company is referring to the public links that are given to each of your uploaded files. On Android, when you receive a link, the phone prompts you with options, such as apps to open it with, etc. Now, when a Dropbox link is shared with you, opening it straight through Dropbox should be your numero uno option. Again, we are shocked this was not already in place by Dropbox. Keep your eyes peeled for the update on Google Play. LG G3 Android 5.0 "Lollipop" Tour!